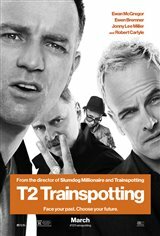 Trainspotting 2 as a sequel does justice to the story in the first film. It is a terrific experience catching up with four unforgettable characters 20 years later after their wild and frantic youth. Ewan McGregor is one of today's best actors. Ewen Bremner as Spud should be nominated for an Academy Award for an emotional, mesmerizing performance. Jonny Lee Miller and Robert Carlyle are brilliant. Trainspotting 2 is terrific time at the movies. I would see it a second time.